The What: Modulo Pi has released a new version of Modulo Kinetic that will be introduced at ISE 2019 in booth K135, Hall 14, on Feb. 5-8. The What Else: Modulo Kinetic is a fully integrated real-time media server solution that can be used across the complete workflow including show study, simulation, encoding, playback, and show control. Modulo Kinetic features a user-friendly 2D compositing tool with non-linear timelines, a low-latency live mixer, and a powerful 3D engine and show controller, all brought into one consistent environment. It handles the most advanced formats including Apple ProRes, HAP up to 8K+, and uncompressed still sequence TGA or 10-bit DPX. To optimize performance and usability, Modulo Pi has developed its own tracking system. Available in Modulo Kinetic’s new version, the optical tracking module allows real-time projection on moving objects, as well as video-projectors auto-calibration. Modulo Kinetic is also compatible with other tracking and motion control solutions such as BlackTrax, or Kinesys. A powerful 3D particles engine offers real-time generative and interactive content. Particles can be created directly in Modulo Kinetic’s user interface. A nodal panel allows to drag-and-drop devices and sensors, and connect them with timelines or 3D scenes to perform real-time tracking or interactive video effects. 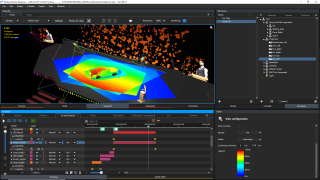 The Bottom Line: Through Modulo Kinetic’s intuitive and collaborative user interface, one can simulate and visualize a show in 3D. Modulo Kinetic’s new version makes real-time VR easy for improved show study and simulation: one single button in Modulo Kinetic’s software allows users to visualize a show scene from any angle with a VR headset. No coding is needed to enjoy all the benefits of Modulo Kinetic’s real-time interactive VR. Modulo Kinetic is available in a regular chassis, and a new ruggedized framework. The reinforced suspended frame and professional connectivity is designed to endure rough conditions.